We are one of the leading manufacturers and suppliers of the highest quality Permanent Magnetic Concentrator Separators, which are manufactured using the finest quality raw material to ensure quality of products and customers' satisfaction. These products are machined according to customers' needs and requirements of customers following international quality guidelines for perfection of high capacity Permanent Magnetic Concentrator Separators. Our reliable, durable and the best performing products are available in the market at market leading prices. Permanent Magnetic Concentrator Separators is extensively used for advancing or concentrating material containing a very high percentage of magnetic or where magnetic/mechanical agitation is required for the separation of many difficult materials. It is perfect for the improving Sponge Iron/Cast Iron borings, Steel/Brass Aluminum turnings, Chips and for mineral beneficiation application such as the purification of dry ceramic and refractory materials, reclamation of abrasive grains, removal of iron contamination from chemical powders and grains and for many other such applications requiring maximum separation with minimum production loss etc. 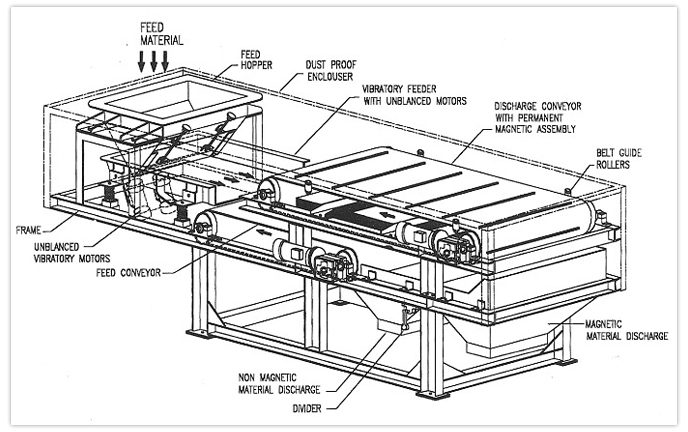 An electromagnetic Vibratory Feeder (with sub-hopper) which provides step less regulation of feed for even flow. Two Conveyor belts The Upper belt running ahead of the lower conveyor belt and in the same direction. Super power Permanent Magnet assembly is picking Tramp Iron from the feed Conveyor. Magnetic and Non-Magnetic Material eill be collected in two different. 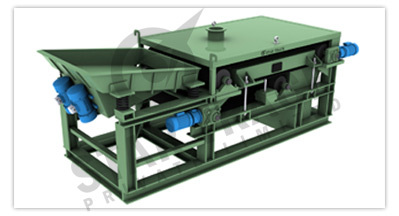 Compact hollow shaft Gearbox & Motors will be provided to drive the belt conveyor. The material to be treated is fed from the vibratory feeder on to lower belt where after traveling a short distance it comes under the belt conveyor. The upper belt conveyor runs under a series of powerful Permanent Magnets arranged in such a manner so that the material is exposed during its travel through a number of magnetic fields of alternating polarity. Due to the continuous repetitive agitation of the material nonmagnetic material falls back on to the lower conveyor belt, while the magnetic material is retained on the upper conveyor belt due to the force of magnetic attraction. The separated material are carried and deposited into the respective magnetic and non-magnetic discharge chutes. The Separator is available in a wide range of sizes and capacities up to approx. 100 TPH and 650mm belt width up to 2000mm belt width. A variable speed drive motor can be furnished in place of the slandered constant motor if varied products are to be handled. The built-in feeder and motor starter can be furnished separately for remote mounting where remote control is desired. Multiple-stage units can be supplied for unusually difficult materials.